Erin’s Outreach Team stays hard at work supporting over 20 organizations, being a beacon of God’s Word, and channeling the Holy Spirit for our community and beyond. The Team’s focus is to share God’s love and help those in need here in Knoxville, as well as in East Tennessee, and throughout the nation and the world through compassion, mutual respect, and love. 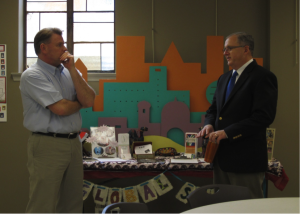 Held a Mission Fair which included displays of over eighteen missions currently supported by Erin Presbyterian, a luncheon, and a presentation by Jan Heckler and Rev. Mamisoa, both visiting from Madagascar. Contributed financially to the Souper Bowl of Caring project held by the youth of Erin on Super Bowl Sunday to benefit the Sevier County food bank. Provided gifts for 50 children through the Angel Tree program. Collected the Christmas Joy Offering. Held a mobile donation drive for Knoxville Area Rescue Ministries. Distributed food at FISH Hospitality Pantry. Formalized a mission partnership with Janice (Jan) Heckler who works with the Church of Jesus Christ in Madagascar. Provided financial support for both UTK and UTC Campus Ministries as they began the new academic year. Collected and delivered furniture, household goods, and food for a family in need. Gathered cleaning supplies, paper goods, diapers, baby formula and other items for a supply run to Baton Rouge. This project was a joint effort by many churches within the Presbytery of East Tennessee to help with flood relief in Louisiana. 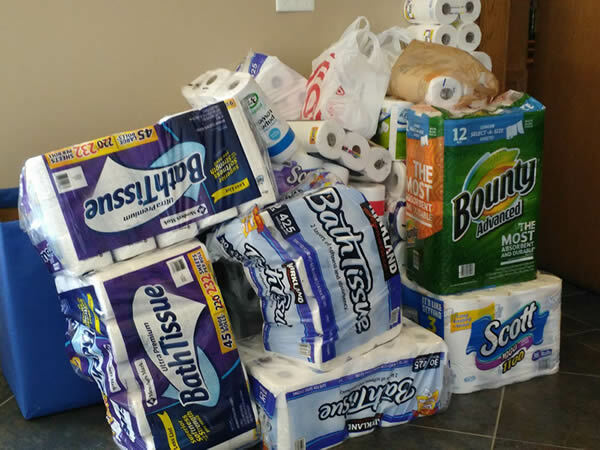 After visiting Mission Haven in Decatur, Georgia and witnessing the valuable service they provide for our missionaries as a “home away from home” with accommodations and a clothes closet, we sent a contribution to help with their ‘needs list’. Attended a presentation by one of our PC (U.S.A.) Mission Co-Workers in the Middle East, the Rev. Elmarie Parker, who is based in Beirut, Lebanon. She spoke about her ministry and work as the Regional Liaison between the PC (U.S.A.) and Presbyterian partner churches in Lebanon, Syrian, and Iran. The program was open to all area churches and the Knoxville community. Collected the Pentecost Special Offering which benefits ministries for younger members of God’s family. Two youth from our congregation are attending the Presbyterian Youth Triennium at Perdue University in July as part of a delegation from the Presbytery of East Tennessee. A portion of the Special Offering will go to help with their expenses as well as to support the offering that will be taken at the Triennium to build ‘calamity resilient’ shelters overseas. Raised funds for Presbyterian Disaster Assistance, Presbyterian Hunger Program, and Self Development of People through the One Great Hour of Sharing Special Offering. Made a special offering to aid victims of the earthquake in Taiwan. Collected soup cans on “Souper Bowl Sunday” – donations delivered to FISH Hospitality Pantry to help re-stock their shelves for winter. Held a congregational “Blue-Out” (everybody wear blue) along with other PC(USA) congregations across the nation to honor the work of Presbyterian Disaster Assistance (PDA) and kick-off the first Sunday of Lent. Donated 1 picnic table, 2 park benches and 2 rocking chairs to Camp John Knox. Made a donation to help the family of Zaevion Dobson, a student at Fulton High School, who was killed while shielding three girls from random gunfire. Made a donation to help pay for the funeral expenses of Earl Terrell, a homeless man in the Knoxville community. 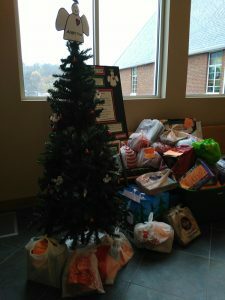 The Angel Tree in December 2015 was our focus for mission. 50 needy children were recipients of the gifts collected. In November 2015 we collected 271 pairs of socks for Volunteer Ministry Center with our “Socks for Soles” campaign. We gathered “Move-in Baskets” for Volunteer Ministry Center to help people transitioning from homelessness to their first apartment. 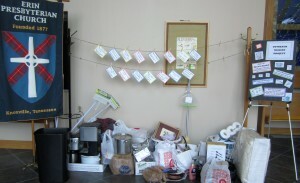 We had great response to our clothes line wish list. Pick an item off the line, bring it in, and load up laundry baskets for “Move-in Baskets”. Between September and December 2015 we held a “Cents-Ability” campaign where we collected loose change at our Wednesday Night Dinners and donated the proceeds to FISH Hospitality Pantry. “Cents-Ability” is part of the larger Presbyterian Church USA’s Hunger Program. 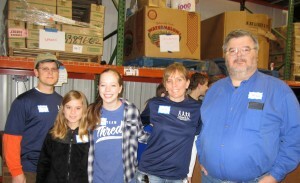 Erin members enjoy working together at the FISH Food Pantry! We are also pleased to partner with our Mission Co-Worker, Janice Heckler and the people of Madagascar. Jan works with the Church of Jesus Christ in Madagascar, facilitating strategic planning and organizational development. The church is heavily involved in health and rural development ministries, evangelism, environment concerns, HIV/AIDS prevention, Christian Education and leadership development. Jan entered mission service in 2012 and brings experience from the fields of education, public health, mental health and social service. Where is God calling you to share your faith, time and talents? Come to our Sunday worship service where one of our team members can give you more information on how you can help through volunteering, planning, fundraising, and more. You can also join us for our monthly meetings, held the second Sunday each month after worship in the Outreach room.